“Science and Innovation during Muslim Civilization and how to present them in Schools and Public Domain"
Dec 10th, 2:00 – 4:00 p.m. Accuracy of historical findings through high quality unbiased scholarship that is aware of modern attitudes to historical events, their interpretation and connectivity. Educationalists experienced in modern methods and techniques, and communication Museum curators who are experienced in communicating historical events and artifacts through modern museology. Science public explainers and TV presenters. The special session provides an opportunity to all concerned scientists in the field to discuss these issues within a professional academic atmosphere. Due to the short notice, this session will not require full papers for submission. An abstract will suffice to allow inclusion of presentations for discussion. Please arrange to send your abstract to the session leader Dr. Hussein M Elmehdi, with the session code SS3 at: ichs14@sharjah.ac.ae. 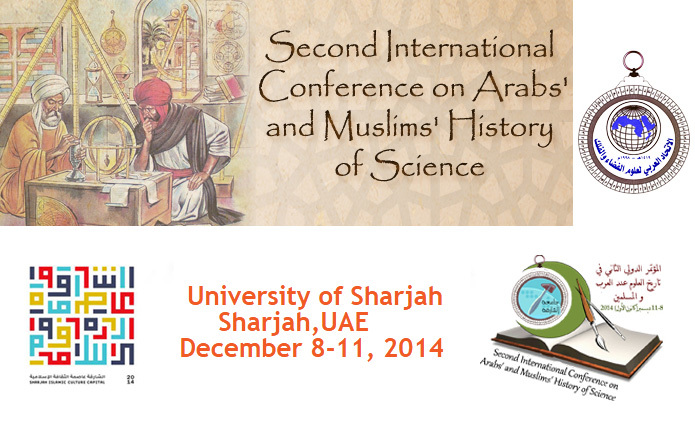 The deadline for receiving abstracts is Nov. 15, 2014. An acceptance notification will be sent no later than Nov. 20, 2014. For more information please visit www.sharjah.ac.ae.